A huge Microgaming ship is about to pull off from the shore. Any minute. Hey, have time to step aboard. 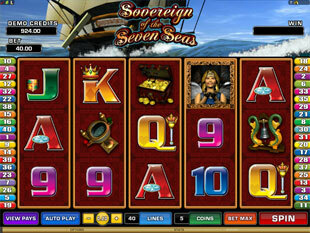 So that to become a member of a stout-hearted crew at Sovereign of the Seven Seas slot machine and… Make a RISKful but rather GAINful voyage to the new gambling lands in a no download version. High spinning waves and a strong gale… Get ready to encounter many ROUGH goings after leaving the quiet harbor and… Prowling the boundless waste of waters on 40 paylines. In search of thrilling adventures. Oh, they will strongly impress you and bring the most captivating jackpot of $1,250 or the scatter trophy of $20,000. Who can refuse such fantastic TREASURES? What about a sudden pirates’ attack? Of course, no one is immune to it afloat. 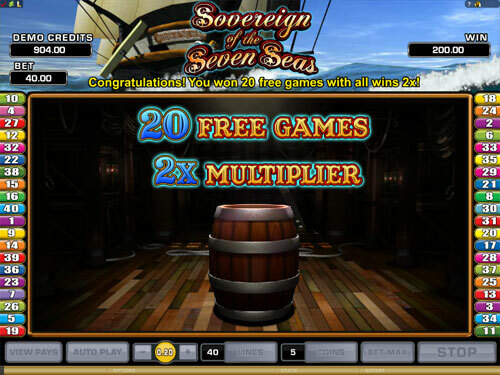 Nevertheless, as long as this 5 reel vessel is sailed by the true seasoned salt, you are able to forget about fears and… Just go adrift waiting for the Chests with Gold and 10, 15 or 20 Free Spins to hit your stern with the Girl Statue on the top. Well, the moment it happens, you’ll surely cry: ‘All hands on deck!’ and fire a salvo using the Cannons! To sound the Ship Bell. To wend your marine way following the Compass. Will you manage to carry out these duties of the Captain‘s mate? No doubt! Any way, you’ll be asked to go through facings and… Show your pLUCK and LUCK at the Double Up Feature handling the cards from Ace to 9 and gaining any of 38 winning combinations. 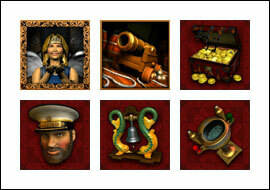 The highest naval jackpot is 1,250 coins or $1,250 for 5 Captain images. 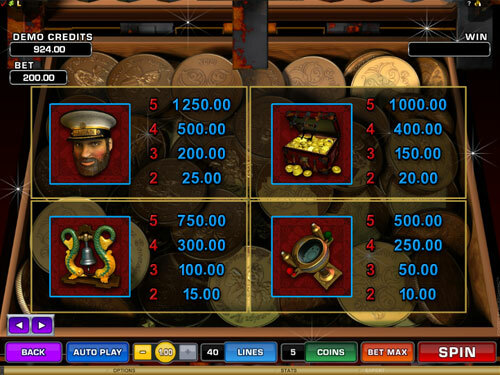 The second naval jackpot is 1,000 coins or $1,000 for 5 Chests with Gold. The third naval jackpot is 750 coins or $750 for 5 Ship Bell symbols. Moreover, passing by the master’s cabin… Just jump at the chance to enter it and glance at the payout map. All the unexplored territories are marked there. And as soon as you reach any of them, you are welcome to be awarded with the certain offshore bestowals and bonuses in addition to the ones you may get from the sea-floor at Leagues of Fortune slots. Look out for trouble if there is a woman on board! Well, is it true? Who knows actually. But it just takes you to put the Girl Statue on the ship’s head and… It will definitely keep you out of danger! Acting like the wild symbol, this Girl Statue can be seen only when you rock on the waves of the 2nd, 3rd and 4th reels. Besides, it is able to expand making the whole reel wild and… Take place of any other nautical images except the scatters. How about aiming the Cannons at the massive winnings? Every shot of this scattered weapon will bring you heaps of coins. What is more, loading 2 Cannons at once, you may double your gains. With ease! Can hear a real scatter ROAR of 5 Cannons firing at the biggest bet? Then… The devastating top prize of $20,000 is knocked out. Get 3, 4 or 5 scatters to trigger your stake by 5, 25 or 100 times respectively and light a spinning fuse! In an instant, the obstacle that blocks your way to the captivating Bonus Game is blown up and… You are offered to benefit from up to 20 Free Spins along with 2x, 3x or 4x Multiplier. So, there isn’t a moment to lose! Bonus Game. A great ship needs deep waters! So, skin the sail and catch the favorable wind with at least 3 scatters. As they will activate the Bonus Feature dragging out 3 barrels for you to choose from. Each of them has the money-making prizes inside. 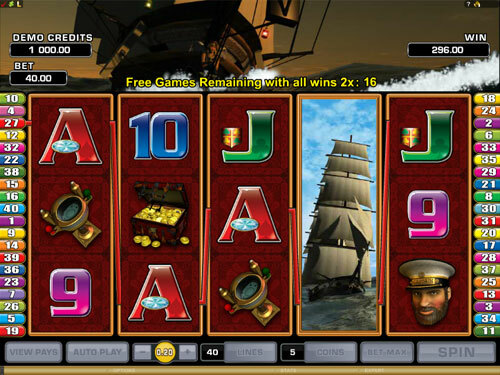 Well, you are able to search out 10 Free Spins there with all the wins quadrupled. At the same time, revealing the keg with 15 Free Spins, you are given a great opportunity to triple your gains. Can open the wooden lid and see 20 Free Spins? Hip-hip-hurrah! That’s the top reward that is worthy of the reel bold spirits swaying in the gambling cradle of the deep. So, just get ready to increase your bonus gifts by 2 times in this case and maybe… You can retrigger this sea-keeping feature. Double Up Feature. You don’t have seasickness, do you? Great! So, you can easily withstand the heavy rolling at the Double Up Feature! Just concentrate on the card guessing. 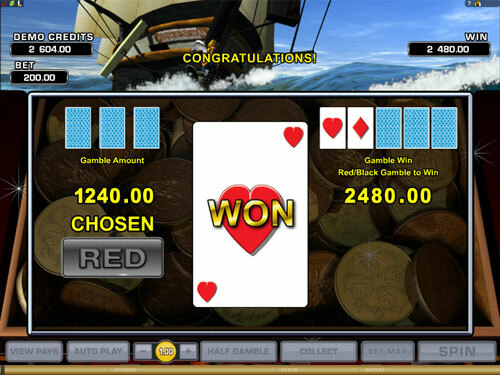 Pointing at the right card color, you grasp the prize equal to your 2x bet. Whereas to lay your hands on the win multiplied by 4 times… It’s necessary to find the correct suit of the card picked. Feel certain that it’s within your scope of abilities. The subtle smell of the blue water attracts many intrepid adventurers. Are you one of them? 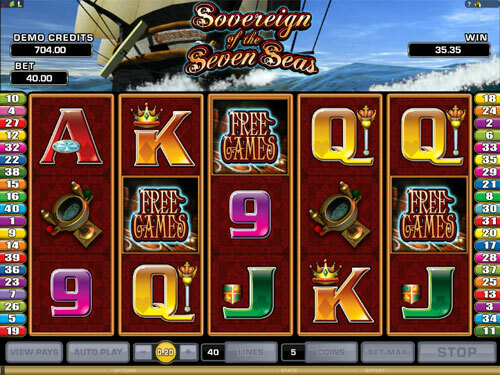 Hey, then… Sovereign of the Seven Seas slots is the right place for you to stay and start winning the grandiose DEEP prizes and jackpots. What if you come across the courageous heroes of Jason and the Golden Fleece slot machine sailing past you with the swift Microgaming stream?